LinkedIn Pulse is an efficient tool if you understand how to use it for promotions and publicizing. It is the best platform available in social media marketing, which will get you the target audience, if your blog-post is sold correctly. It has user-friendly features that are easy to understand and implement. LinkedIn; a certified web tool catering to a business group of professionals where they can interact and know more on industrial advancements along with prospect job opportunities. Augmenting viewers with intent of upholding businesses is the sole rationale of LinkedIn Pulse – an enhancement fashioned for promoting blogs. This was made public in February 2014 and since then has been an ideal tool for social media aficionados. However question is, how to use it practically to craft outcomes (bump up exposures) that it is expected to deliver? 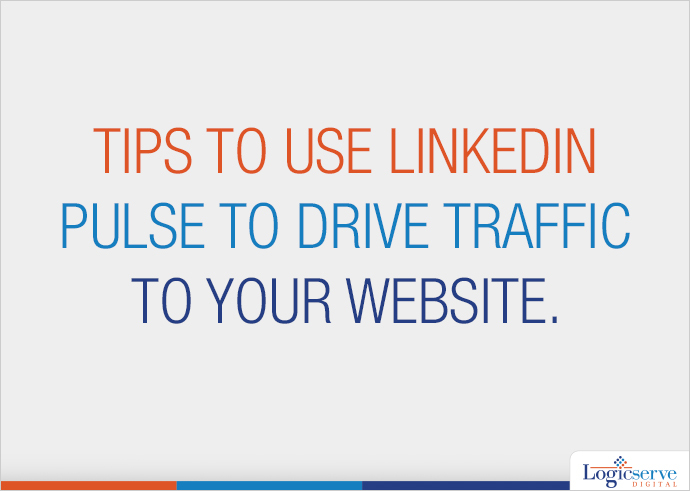 We discuss some tips on how to use LinkedIn Pulse to drive traffic to your website. Use the appropriate HD images with an appealing effect : Words can never do what a picture can, follow this ideology and keep in mind that the brain connects better to images than words. It functions as your first impression to potential readers. Feature Pertinent Keywords : Be innovative in what you write; choose topics that are more likely to attract viewership. Choose Engaging Titles : After image, this is what plays a pivotal role in whether the target audiences choose to click on your blog-post or not? Abridge your Article (keep it under 1000 words) : It is reasonable, right? Think it this way, how often do we engage ourselves in reading posts that have no end? Embed a video that advertises your company towards the end of your blog post : Research on which multimedia works well with LinkedIn and use it as a platform to publicize. Also consider to call for comments from users. Hashtag It : Think as a viewer and incorporate suitable hash tags to ensure your post is surfaced readily on this platform. Spend Some Bucks : By choosing to spend a few busks (roughly $50) on social media’s ‘promoted posts’ feature, you can build a generously proportioned traffic on LinkedIn Pulse. Reuse your Material – LinkedIn allows you to republish your own blog-post; if your article did not do well the last time you published it, simply repost it. Expand your LinkedIn Network : Obviously, when you have more number of contacts, you have a larger audience. Mutate and vend your profile productively to increase your connections, stretching out to even those people who you are not yet acquainted with. Add Hyperlinks to Keywords : This is an excellent method to drive traffic to your website; just make sure, the viewers are redirected to correct landing pages when they click the link. Write Often : This is simple to identify with. People have short memories and if you publish a blog post once in months, you will fail to create an engaging audience. Ideally, try writing twice a week. Get It Featured : If you think your article has done well, tweet this to the LinkedIn editorial team to get your post featured. If you can pull this off, it implies added attention, thereby more followers. SEO friendly : In the end, bear in mind that what is posted on LinkedIn Pulse is SEO responsive. Your article is bound to be seen by numerous folks interested in an analogous area.